I carved a little time in my studio today, YAY! I saw an idea for this card in the Stampin Up catalog. Same stamp set, different colors, and I got my snowman's head to high over his body, but maybe when he jumped for joy that it was going to snow his head hasn't settled back down. I'm really loving this new color Marina Mist that Stampin Up came out with. I should have pulled out my treat cups for Halloween, but Christmas is a good time for treats also. Paper Sundaes PSC #43-Let It Snow! Supplies: White Card Blank 5" X 6 1/2" Halcraft, Papers: Stampin Up-Brushed Silver Card Stock, Marina Mist, Specialty Designer Series Paper Candy Cane Christmas, Stamp: Stampin Up-Big On Christmas, Ink: Stampin Up-Whisper White craft, Not Quite Navy, Marina Mist marker, Sakura Gelly Roll Pen-White, Stampin Up-treat cup, Barbara Trombley's art glitter-White, beads unknown, Fiskars shape cutter template-Circles-1, Stampin Up-1 3/4" circle punch, ribbon-Michael's Celebrate It!, Stampin Up dimensionals. Adorable card! Love the shaker design! Thanks for joining The Paper Players this week! What a brilliant shaker card. Its stunning. Thankyou for sharing with us at OSAAT for our Winter Wonderland challenge. Good Luck ! A gorgeous card! Thanks for joining us at Paper Sundaes this week. Wow - what a clever idea! Super cute too! 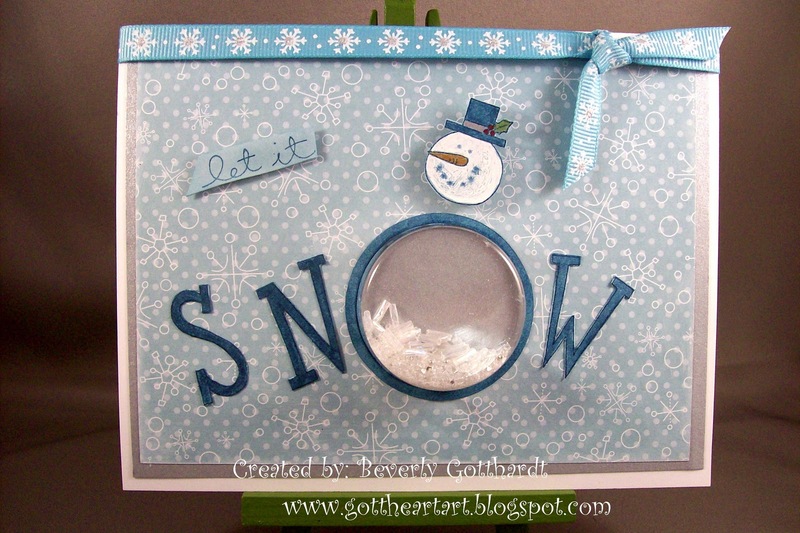 Thanks for joining us at Paper Sundaes for our Let It Snow challenge! Good to see you back at the Paper Players! I adore your clever card and the shaker. So cute! !